The map covers the metropolitan Sydney region of the state of New South Wales in Eastern Australia. Sydney is Australia's largest city with a population of almost 4 million, and is the primary port of entry for international visitors. Most recently renowned as host city of the 2000 Olympic Games, Sydney is also the business and tourism hub of the nation, and is increasingly a major centre within the Asia-Pacific region. Blessed with a wonderful setting on Sydney Harbour, and a benign climate, Sydney is a great tourist's city. Although not the first point at which Europeans landed in Australia, it was the first permanent European settlement, and is Australia's oldest established city. Sydney Trains, the Sydney metropolitan rail operator, provide frequent trains between Sydney and most suburbs over an intensive network of lines. 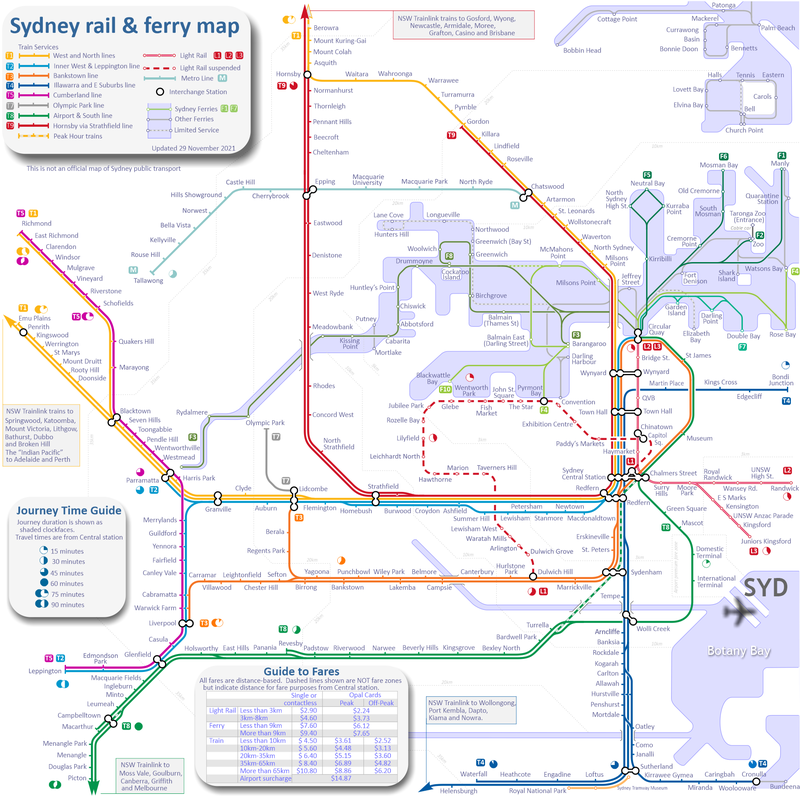 Most lines operate through the City Railway - either running around the City Circle, through the Eastern Suburbs Railway to Bondi Junction, or across the Sydney Harbour Bridge to North Sydney. Sydney trains are frequent and well-used, although they have a reputation, deserved or otherwise, of being a touch unreliable. Of particular interest is that the entire Sydney train network is operated by electric double-deck trains. Sydney Central station is a grand edifice somewhat in the style of European or North American grand terminal stations befitting its position as the departure point for some of Australia's great long-distance trains. In recent years it has been tastefully restored and is worth a look for anyone who appreciates fine architecture. 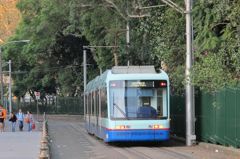 Sydney also possesses a re-born although embryonic tramway system called Sydney Light Rail that runs from Central Station into the inner west suburbs along a former railway line to Lilyfield and Dulwich Hill. A further extension is planned along downtown city streets to Circular Quay and into the South-Eastern Suburbs of Kingsford and Randwick. Find and book conveniently located Sydney hotels online with Australian Rail Maps and booking.com. Book Online now. No booking fees. Pay the Hotel when you stay. By far the most famous of Sydney's public transport however are the Ferries - most notable that from Sydney to Manly. 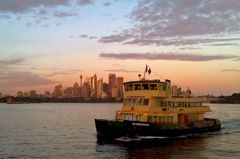 No trip to Sydney is complete without a journey from Sydney to Manly on a ferry, and indeed there is something to be said for spending a day cruising around the harbour on the many inner harbour ferries. All ferries operate to and from Circular Quay.